Note: The CRD155B product has been discontinued. All of the information, downloads, and resources remain here and available to support our previous customers for this product. If there are any questions regarding this, please contact us. The CRD155B is an 8-bit card designed for the ISA bus, offering 24 bits of digital I/O. The CRD155B can serve many useful purposes for the hobbyist or professional, from controlling relays or monitoring switches to any other task involving the reading or writing of data. This card is perfect for the beginning hobbyist or the experienced engineer; and with the included software, programming the card is simple and straightforward. The 24 I/O lines are split up into 3 ports of 8 bits each. The I/O lines may be accessed via a female DB-25 connector on the card's backplane. The card occupies a span of 4 addresses in the computer's I/O address space. A set of four DIP switches allows a total of 16 possible base addresses for the card, thus allowing you to install multiple cards in the same computer. The heart of this card is the popular 8255 interface chip (specifically, a 82C55), which is very flexible yet easy to use. If you have worked with the 8255 before, then you already understand the architecture of the CRD155B. The 8255 chip makes each I/O port programmable as either an input port or output port. All ports can be operated as simple inputs or outputs. In addition, two of the ports can be configured for uni-directional communication using handshake lines. One port can also be used for full bi-directional communication with handshake lines. The CRD155B card preserves the functionality of the 82C55 chip and allows the user to take full advantage of its flexibility. 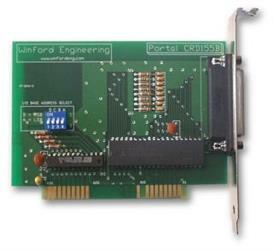 One of the ways the CRD155B card can be programmed and controlled is by using Winford Engineering's Portal API, which is an applications programming interface for Windows and Linux. This provides a high-level programming interface to the card. It relieves the programmer from some of the details specific to the card and allows him to focus more on just accessing and processing data. Currently, Mode 0 of the 82C55 chip is supported by the Portal API. Documentation is provided, and sample code is available to serve as an instructional tool. The CRD155B can also be programmed in a lower-level fashion. The card's 82C55 chip can be directly accessed using port I/O functions in your programming language of choice. Any programming language in which you have I/O port access can be used to program the card in this fashion. The card can be configured and data can be written and read by using simple port I/O commands. For DOS languages, I/O is typically supported directly (e.g. INP and OUT in the BASIC programming language). For Windows languages, Winford Engineering provides the PortIO32 driver and library, which provides I/O port access. The CRD155B product disk includes Portal and PortIO32 libraries for Windows and Linux platforms. The disk also includes full documentation for both libraries as well as sample programs. Download Portal, PortIO32, the user manual, or the product disk. You can download the complete user manual for CRD155B. It is available in PDF format. 82C55 data sheets contain much useful information for those interested in taking advantage of all the capabilities of this versatile chip.